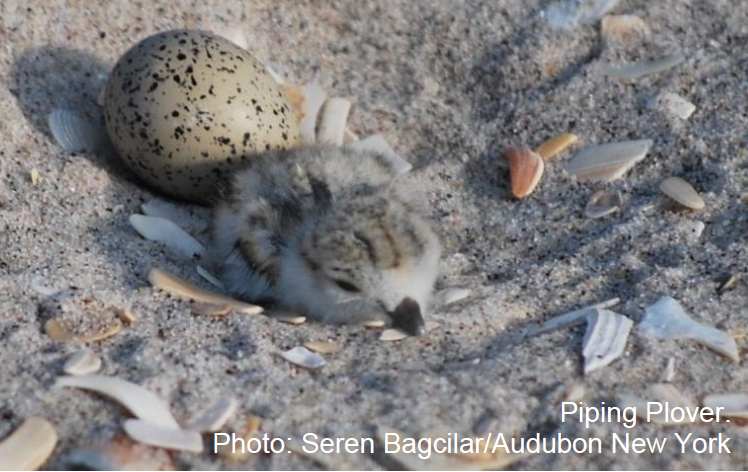 Since 2013, Audubon New York staff, volunteers, and partners have been working to increase the awareness of and reduce threats to beach-nesting birds by encouraging beach-goers to pledge to “share the shore” with Piping Plovers and other beach-nesting bird species. During our on-the-beach outreach days, we set up a tent and table at the entrance to heavily-visited Long Island beaches and engage with as many beach-goers as we can to teach about beach-nesting birds. We'll also set up activities and games to further engage our audience. We provide visitors with pamphlets and brochures about beach-nesting bird biology, our conservation work, and information on how to reduce disturbances to birds. Then, we ask visitors to sign our “Be a Good Egg” pledge and therefore agree to keep out of fenced off nesting areas, keep trash off the beach, and keep dogs off of nesting beaches. Prior to these outreach events, we’ll ask new volunteers to complete a brief online training webinar. Please contact NYcoast@audubon.org for more information and registration to volunteer for this exciting outreach program. Questions: For Questions about this event, please contact Arielle Santos with Audubon New York at 516.922.3200 or arielle.santos@audubon.org.